One of the biggest caveats for compulsive eaters is to understand the difference between cravings and hunger. After years of dieting and binging, emotional eaters tend to confuse cravings with hunger and vice versa. Eating becomes really stressful because you just don’t know when you should eat and how much. I know a person who felt eating breakfast was not normal. She would starve herself the previous day and freak out the next morning because she believed it was abnormal for her to feel hungry. That caused her so much anxiety over food that she couldn’t eat anything without guilt. Hunger is a very natural desire. Cravings are not. As long as you continue to confuse them, you won’t be able to control your weight. You just won’t know how much food is enough. You’ll feel guilty or frenetic each time you have a cookie. You’ll obsess on food and make your life miserable. Let me show you how to break free of the hunger-craving guilt loop and finally get the peace of mind and weight you deserve. When you completely lose touch with your hunger, it becomes easy to eat just about anything at any time. I remember a time when I was overweight. I was eating food to comfort me, not to feed me. It felt so natural at the time but now I see how much it wasn’t. I now trust my body to tell me what it needs. I know I tend to eat a little bit more in winter and PMS and less in Spring and Summer and in between PMS. I don’t wrestle with my hunger. I make sure that my body gets enough water and moisture and fiber rich food. I choose nutritious, fresh and home-cooked food. I follow very simple rules and an essential yet very basic one is when I’m hungry I eat. I believe these very simple guidelines are what keeps me slim even though I drink hot chocolate and eat cheesecake or chocolate fondant once in a while. I never ever feel guilty when I do. It’s fun but it’s not the high point of my day. It’s just part of my diet. I hope you understand now how vital it is to get back in touch with your hunger if you want to control your weight like the French lady that I am. Now that I have your attention, let me share with you three ways to get back in touch with your hunger. The first obvious one is to stop dieting and start eating home-cooked meals whenever possible three times a day. Eat as much as you want, but mostly at breakfast, lunch and dinner. I often have a fruit or snack around 5PM and have dinner around 7 to 8 PM. If I feel very hungry I eat at 7. You can do the same for lunch time. I also try to drink enough water in between meals and follow the simple guidelines I have mentioned above. Of course, this won’t help much if you still don’t know how to differentiate between hunger and cravings. One very simple way to do this at first is to use my favorite craving buster technique. It’s super simple and works in 8-12 minutes. What is so awesome about this technique is that it will help you get rid of food cravings but not hunger. You can use it when in doubt. I have made a video just to help you get started in minutes. To see it, please subscribe to my newsletter below. Feelings of hunger come on gradually. You may feel your stomach move and make noises. If you’re stressed out, your abdominal muscles may block the natural movement of your stomach and all you’ll feel is a bit light-headed. If you eat large enough meals (no sandwiches) at approximately regular hours, you will be more likely to sense hunger signs becoming more and more intense as the next meal approaches. If they become uncomfortable, eat. You may also want to deeply relax. Put your hand on your heart. Take a few deep breaths and monitor your bodily signs. I can feel slight pain in my stomach as I’m getting closer to noon. With a little practice, you’ll be able to feel it too. You can move meal time and food quantity up and down if needed. For example, I felt very hungry two days ago around dinner so at 7pm I ate homemade chilli con carne. I needed something filling, so I ate something with beans. I didn’t think twice about it the next day and my hunger was pretty normal after that. So when hungry, eat and eat as much as you want. Eat real food (no chemicals, preservatives, hydrogenated oils, etc.). It took me 15 minutes to cook my dinner. I’m not a French chef. I do simple stuff but I make sure I enjoy what I eat. I know you can too. If you’re cooking for the whole family and you feel hungry, don’t make excuses about it. Have an avocado or something extra if you need. The most important thing to remember here is when you’re hungry, eat. If you don’t yet know whether it’s hunger, check if it’s a craving. Try to make it go away. If it won’t, eat. Try to feel when you’ve had enough. If you don’t feel hungry any more, stop eating. You can take three deep breaths throughout the meal and check whether you’re still hungry. I tend to eat as much as I want but sometimes I will stop slightly sooner, because I know my brain needs 15 minutes to record the fact that I have eaten, so I wait a little and see if I still need something. Forget cleaning your plate forever. Eat only when you’re hungry. From now on, this should be your number one goal, because it’s the simplest and fastest way to lose weight without trying. I don’t care what any new fad diet may tell you. I have been slim for years and I know I can gain weight quite quickly. It’s not like I have super skinny genes or hyper high metabolism. I think that having enough integrity to stop eating when I don’t feel like it is having respect for myself and I’m not pleasing anyone to make them feel good about their cooking. Learn to trust and respect yourself the same way. Uncontrollable cravings can make you lose control of your weight, your sense of integrity, self-confidence and personal power faster than an ice-cream melts in a sunny summer afternoon. 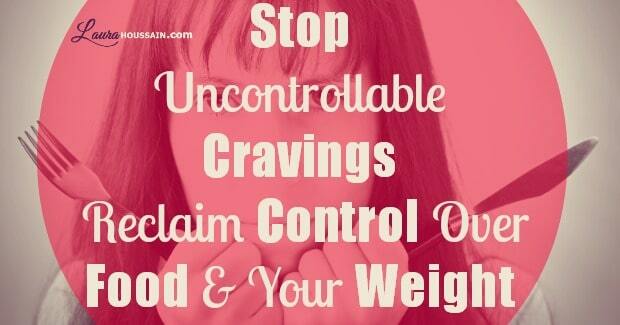 Cravings are the number one reason emotional eaters lose touch with their hunger. Now you know that once they do, they are pretty much doomed to gain weight over time. If you are craving food all day, first make sure it’s not hunger. Apply all my above recommendation and see how you feel after that. A scientist will tell you that your brain was trained from an early age to associate sweet and fat food with pleasure and that is the reason why you can enjoy eating without hunger. Your brain creates an association between eating and pleasure. Every time you associate something with pleasure and skillfully reinforce that association through repetition, you create a conditioned response. For example, when I was a smoker, my brain used to associate smoking with pleasure. I think it was more the relief from withdrawal symptoms than anything, but still for my brain it meant some form of pleasure. Every cigarette reinforced the association until I almost became a chain smoker. Compulsive eaters, too, create an expectation of pleasure, but associated with the pleasure of eating. The expectation of pleasure is so great that when too much dissatisfaction piles up inside, the only thing an emotional eater can think about is food. For example, a client of mine had a relapse when she felt lonely and unloved after having dinner with her love interest and his charming wife. She didn’t make the connection at first. She just new she needed that pleasure and the cravings returned. You don’t have to be aware of it for it to be true. For example, I had a client who just couldn’t feel anything. She just knew she was attracted to sweet and fat foods and that she had to have them at unexpected times but regularly. When I told her that she would have to listen to her emotions and internal dialogue, she felt she couldn’t do it. It’s easy to stop cravings once you know how, so I taught her that, but I don’t think I could stop emotional eating entirely at this stage. I was a food addict for a few months. I used food to comfort my home sickness. Every night I had to have the same sweets. It was a ritual. I didn’t realize at the time I was using food as a psychoactive drug to alleviate the pain of feeling isolated. Very much like my client, I probably would have denied it because it would have felt unsafe to let my cravings go. The first and most simple way is to use the technique I give my subscribers. It works really fast and alleviates stress and negative emotions at the same time. If you haven’t used it yet, please subscribe to my newsletter below to gain instant access. There are more very quick techniques like this one that you can learn to stop cravings in a few minutes but they probably won’t be enough. I know people who are so convinced that they will not be able to cope without the foods they crave that, they just never use the above techniques. For example, I know a renowned professional coach who is more than qualified to help himself stop any cravings, but he just won’t do it consistently enough to achieve permanent results. How do I know? He is still gaining weight, certainly up until the last time I saw him. I personally wouldn’t be fully satisfied, if I didn’t help my clients learn how to live craving free lives. I can help you stop cravings for weeks and months, and often in one session, but if you don’t change the way you handle emotions, the cravings will return. You then have three options. You can either make them go away each time you feel them or you can learn which beliefs and thoughts have triggered them and then make them go away or you can deny that they are cravings and keep on gaining weight until you just stop looking at yourself in the mirror. Personally I like the second option best because it gives permanent results. If you do this correctly, not only will you feel confident to face anything life throws at you but you’ll have the power to choose your thoughts and create a new life for yourself and most importantly, you’ll never be afraid of relapses or obsess on foods for long. All it takes is desire, courage, persistence and imagination. I asked on my Facebook page whether my readers believed that addiction was a lack of will power. Most replied “yes”. Funnily enough, a friend of mine told me recently that she quit smoking with will power. She said “I’m strong. I want to smoke every day but I don’t do it.” I don’t know about you, but would you rather have no cravings at all and never think of smoking, or think about it every day and fight the urge with all your might?. I know which option I’d pick! So to sum up, use craving busting techniques and the above simple guidelines to reconnect with your natural hunger. This will help you control your weight without dieting and enjoy looking at your slim body in the mirror. If cravings keep coming back over and over and you just feel like giving up and indulging them, accept that you’ll have to learn to take care of yourself and your emotional needs differently. It’s easy and very pleasant. You may encounter some turbulence for a short time, but think of the pride and self-confidence next time you look at yourself in the mirror and see that you have lost weight and reclaimed total control over food cravings. Won’t that feel absolutely wonderful? I’m coming up with a simple program that will help you just do that. It’s not like anything you’ve seen so make sure to subscribe to my newsletter if you want me to keep you updated when it’s ready.